Winning a playoff soccer game via penalty-kick shootout can be one of the most thrilling ways to earn a victory. It can also be one of the most devastating ways a season can end. Centennial found that out the hard way on Saturday night. 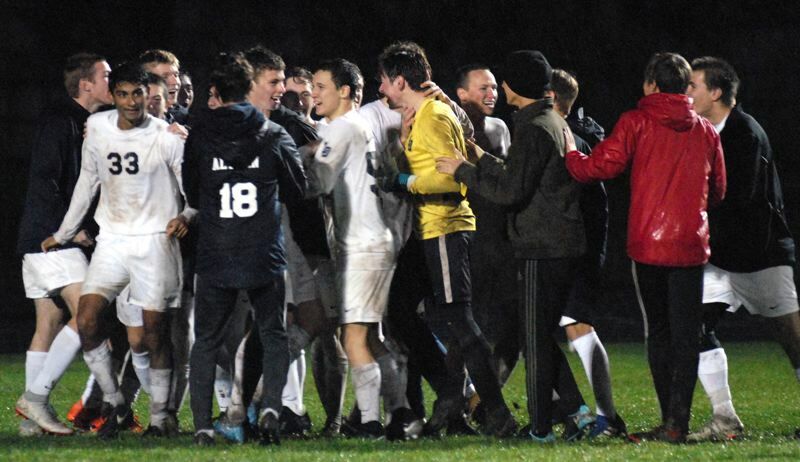 Laker senior Sidharth Daga knocked in the winning penalty shot for the Lakers with a bullet into the right corner of the goal, giving Lake Oswego a 3-2 (5-4 PKs) win over Centennial in the first round of the Class 6A state playoffs. "It was a really big relief," Daga said. "This game was a battle, but we got the job done." On the other side, Centennial coach Todd Saks was understandably distraught after the game. "There are really no words," Saks said. "I'm proud of the fight we showed tonight. I thought we had more opportunities at goals than (Lake Oswego) did, we just couldn't find that go-ahead goal when we needed it." With the win, the 22nd-ranked Lakers improved to 8-5-2 after tying for fifth in the Three Rivers League. Next up, Lake Oswego will play at No. 6 West Linn (10-2-3 overall after winning the TRL) at 7 p.m. Tuesday. The No. 11 Eagles, meanwhile, finished 7-5-4 overall after placing sixth in the Mt. Hood Conference. Lake Oswego scored in the opening minute of the game when Daga played a great ball to Javas Wray, who dribbled past a pair of Centennial defenders and knocked in a shot to give the Lakers the 1-0 lead. Centennial, however, responded moments later. After getting past the Lake Oswego back line, Nathan Feltner got fouled in the box and was awarded a penalty kick. The junior midfielder put the shot away to tie the game at 1-1. Before the end of the half, the Eagles were able to put another goal on the board. Andrew Martinez got a ball from the outside and banged one into the back of the net to give Centennial a 2-1 lead at the break. "We settled in really nicely after giving up that first goal," Saks said. "Battling back to go up 2-1 at halftime was pretty impressive. It showed that we could come back and put pressure on them." But midway through the second half, Lake Oswego sophomore Eric Seaman headed in a free kick for Lake Oswego to tie the game at 2-2. "We just adjusted at halftime and threw some different systems at them," Lake Oswego coach Fraser Morrison said. "One of our team mantras has been to leave everything on the field and that's what the boys did." Centennial had a great opportunity to score late in the second half when Bryan Sanguino found Aye Doe Chan cutting across the middle. But Lake Oswego keeper Anthony Intraversato turned the Eagles away with a key save to force overtime. Intraversato also made a pair of sliding kick saves in the opening minute of the extra session to keep the Eagles from gaining the lead. Neither team got a solid look at the net in the final 10 minutes of overtime, forcing the game to be decided by penalty kicks. There, each squad's top two shooters proved to be cool under pressure. Feltner and Brandon Torralba put in Centennial's first two shots, while Seaman and Christopher Anissian scored Lake Oswego's first two goals of the shootout. Joseph Banut took the third shot for Centennial and went right, but Intraversato — a senior made the right guess and came up with a huge diving stop to give the Lakers the advantage. "We had been practicing (penalty kicks) all week. But that doesn't mean that it will equate to success during the game," Saks said. Both teams made their next two shots, meaning that Daga would have the chance to put the game away if he could get one between the posts. "I knew that I was going to the right. I always go to the right," Daga said. The senior was true to his word as he knocked one into the right side just past the outstretched arms of Centennial keeper Gabriel Jaramillo to send the Lakers off to victory. "These games can be emotional roller coasters," Morrison said. "We did a phenomenal job and kept fighting no matter what." Lake Oswego will face off against West Linn in the second round at 7 p.m. Tuesday at West Linn High School.